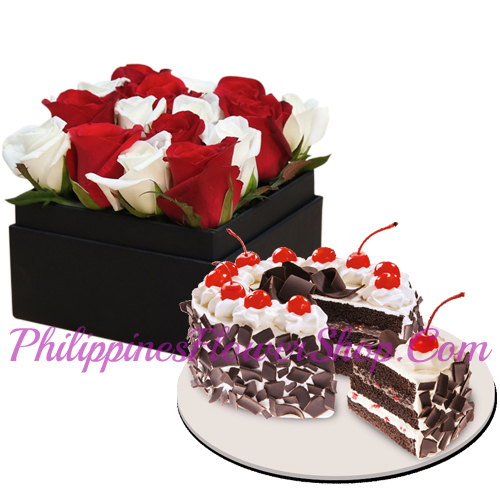 12 White & Red Roses Box with Black Forest Cake. Be swept off your feet with an Enchanting Romance! mixed color roses symbolize nothing other than true affection and love. Find that divine moment in your life with a symbol of love in the most unexpected way. Delivery Area: And any part in the philippines. -Same day delivery for METRO MANILA . Cut-off time at 1:00 PM Philippine Standard Time. -For Provincial delivery : Place order at least 1 day prior to delivery date. -Your purchase includes a complimentary personalized gift card. -PhilippinesFlowerShop reserves right to cancel or request for pick-up any order if delivery address is out of coverage area. -Shipping fee is required whether its delivery or pick up.